We surveyed 1,100+ educators, administrators, and parents about the professional development, resources, and support for social and emotional learning (SEL) in PreK-12 classrooms. Get the full survey report! Nearly two-thirds of educators surveyed said their school is in the process of implementing a school-wide strategic SEL plan. 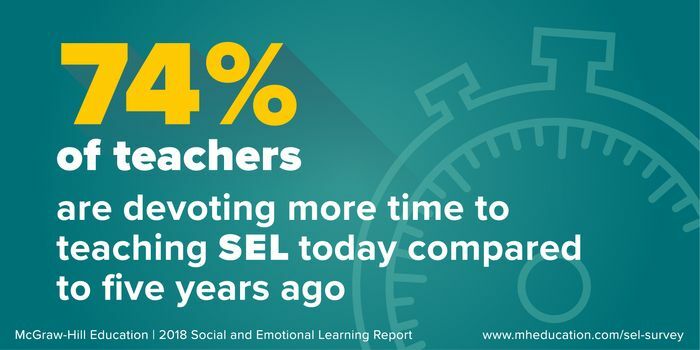 Three-quarters of teachers surveyed say they are teaching SEL in their classroom, and 74% of teachers say they are devoting more time to teaching SEL today compared to five years ago. Nearly two-thirds of teachers surveyed said they need more time to teach SEL skills. Only 64% of teachers currently teaching SEL felt they were only "somewhat prepared" to teach SEL, and only 22% felt they were "very prepared." Over half of the teachers (51%) said that the level of professional development offered on SEL at their school is not sufficient.